Ten pieces of sculpture which realised top sale prices. 10. Jeff Koons - Tulips, 1995-2004. Mirror-polished stainless steel with transparent colour coating. 203cm x 457cm x 521cm. The work was sold to hotel owner Steve Wynn for US$33.7 million during a Christie’s post-war and contemporary art sale in November 2012. Koons is reported as having said “there are no hidden meanings in his works, nor any critiques.” Some critics have berated some of his works as being kitsch and cynical self-merchandising. 9. Constantin Brâncuși (1876-1957) - Madame LR, 1914-1917. 117.1 cm. Sold to Yves Saint Laurent in 2009 for US$37.6 million. 8. Henri Matisse - Nu de dos 4 état (Back IV), 1958. Bronze with dark brown patina, Height 189.2 cm. Conceived circa 1930 and cast in 1978. Sold at auction in 2010 for US$48.4 million to a private collector. 7. Alberto Giacometti - Grand tête mince. 1955. Giacometti’s brass bust was sold to a private collection for US$53.3 million in 2010 and in 2013 it was sold again for US$50 million. The 5,000 year old limestone Mesopotamian statue discovered near Baghdad depicts a muscular anthropomorphic lioness-woman, Sold at Sotheby’s in New York for US$57.2 million in 2007. Koons’ Balloon Dog (Orange) sold in 2013 for US$58.4 million, at that time making it the most expensive sculpture ever sold of a living artist. Mirror-polished stainless steel with transparent colour coating and measuring 307.3 cm x 363.2 cm x 114.3 cm, the work is one of five in a series with the other versions being blue, magenta, red and yellow. 4. Amedeo Modigliani - Tête. 1910-1912. In his lifetime, artist Modigliani created twenty seven sculptures, only ten of which are currently privately owned. In 2010, Tête was sold to a private collector for US$59.5 million, making Modigliani’s sculpture the most expensive work of art ever to be sold at an art auction in France.The limestone head stands at over 61 cm tall and depicts the head of a woman wearing a tribal mask with her hair swept back. 3. Alberto Giacometti - Chariot. 1950. In 1947, when discussing this piece with his dealer, Pierre Matisse, Giacometti commented, “I saw the sculpture before me as if already done.” Rising above two high wheels resembling those of an ancient Egyptian chariot, a filament-thin woman stands poised in precarious equilibrium. After remaining in the same private collection for over fourty years, the work was sold at Sotheby’s in New York in 2014 for US$101 million. 2. Alberto Giacometti - L’homme qui marche I. 1961. Conceived in 1950 and cast in 1951-52. This piece measures 144.7 cm. 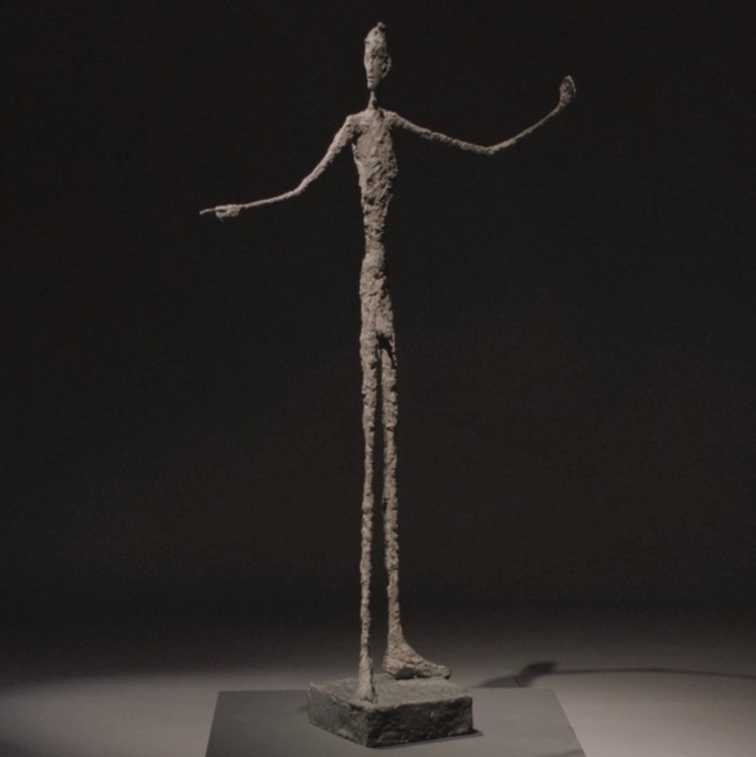 Giacometti’s life-sized bronze sculpture sold in 2010 for US$104.3 million. 1. Alberto Giacometti - L’homme au Doigt, 1947. On 11th May 2015, one of Giacometti’s bronze sculptures L'homme au Doigt “Pointing Man” (1.79 m x 1.03 m x 42 cm) went to auction having been in the same private collection for fourty five years. It sold for an unprecedented US$141.3 million, making it the most expensive sculpture ever to be sold. It beggars belief that Alberto Giacometti created six casts of L’homme au Doigt plus an artist’s proof. A metaphorical demonstration of an ability to print money.